�����The metals have been advancing over the last couple of weeks as Gold chases $1,300; this morning Gold is at $1,289 and Silver is at $18.55. Premiums have fallen on Proof Gold and Silver Eagles as buyers are backing off on purchases, waiting for lower levels. While bullion has increased, premiums have tightened in order to create sales. One ounce Proof Gold Eagles in the OGP are now just $150 over the bullion price; currently at $1,439. Proof Silver Eagles are down to $43-$44. �����With the dealer teletype systems focusing more on bullion items, there seems to be fewer collector coins being offered and Market prices are declining. 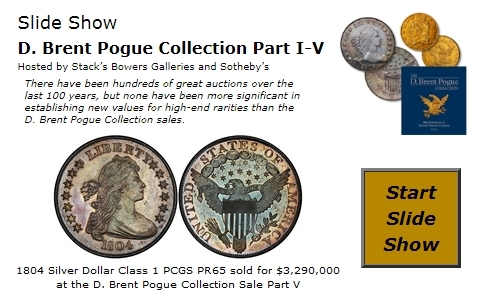 However, recent auctions have shown that there are still plenty of collectors and investors in the market for true rarities. 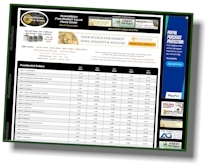 �����In this week�s LD Wholesale Market Dealer Price Guide there are numerous increases for coins that are just not seen in the market very often. The 1804 Half Cent with Spiked Chin is higher in both the MS65 & MS66 BN grades at $15,500 and $27,500, respectively. This is a very rare date in the upper grades with just three coins certified in MS65 and one in MS66. There is only one coin in the Red/Brown category and that one is an MS63. �����Another extremely tough coin is the 1809 Circle inside 0 with just four coins certified in all Mint State grades. The MS66 BN is the highest graded with one certified; the new Market price is $90,000. �����In the Large Cents chart, the 1793 Liberty Cap in AU53, AU55, & AU58 have increased. 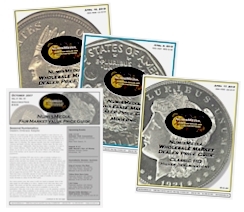 While there are a couple of Mint State coins certified, they are rarely seen in this grade. However, the AU53 is now at $165,000 Market, the AU55 is a higher $290,000 and the AU58 climbed to $500,000. �����The 1794 Head of 1794 is a popular date, and while it does have several coins certified in Mint State grades, they typically command strong prices when traded. The MS63 through MS67 RB grades have advanced with the MS67 now at $350,000 Market.